Soothes effects of occasional heartburn! Now With 3.6 Billion CFU's per capsule. Pro-Biotics Plus® is an advanced, high quality probiotic plus 5 natural immune support Ingredients to help you get healthy and maintain overall wellness. Pro-Biotics Plus® combines some of nature's most effective immune strengtheners into one easy to swallow capsule. Pro-Biotics Plus® capsules are safe and contain only the highest quality ingredients with the strictest manufacturing standards to ensure purity and efficacy. It is safe, all natural. This is a formula you can trust. You'll begin to strengthen your immune system immediately. A lot of our eating habits are contributing to a startling decline in the quality of nutrition that we are able to absorb. A growing number of people are faced with health issues as a result of the life style from fast food dining and junk food snacking. There have been many TV shows that have brought out the importance of using probiotics for helping support your immune system when having food allergies. Food allergies can cause many problems. Remember also take a digestive enzyme to help with digesting your foods. Using Enzymes with Probiotics, gives you a two fold approach to good health. Many others may also have problems with nutritional deficiencies related to insufficient food consumption or health issues with a diet with limited variety. All of us need to eat fresh fruits, fresh vegetables and lean proteins, but this does not always happen. Also many life-style factors are killing off our natural balance of intestinal flora, called probiotics, which further inhibits our system from even getting the nutrition from the food we eat. Prebiotics are non digestible nutrients that are used as an energy source by certain beneficial bacteria that naturally live in your intestines. Prebiotics are sometimes known as fermentable fiber. Probiotics, in contrast, are the beneficial, or friendly, bacteria themselves. By acting as a food source, prebiotics give the probiotic bacteria a chance to exert their influence. These friendly bacteria may have several health benefits, from aiding digesting to boosting immunity. But stress, a poor diet, certain medical conditions, medications and other factors may decrease the number of healthy bacteria. Eating a diet that includes prebiotics and probiotics may help restore these friendly bacteria. Probiotic bacteria in our bodies are essential to maintaining good health, as proven by many years of scientific research! Normally you have an abundance of friendly bacteria, but certain circumstances can lead to a depletion of these essential microorganisms. Infectious diseases continue to claim lives - Pro-Biotics Plus® Offers an Immune boosting solution. List of Ingredients on the label. Bifidobacterium bifidum (probiotic) is a normal inhabitant of the intestines. Found in large numbers, especially in children and adolescents, the numbers of bifidobacteria decrease with age. B. bifidum helps detoxify the intestines and promote regular bowel movements. Lactobacillus Acidophilus DDS-1 (probiotic) This DDS-1 strain of Lactobacillus acidophilus is a unique, highly-stable probiotic microorganism, which, when produced according to Dr. Shahani’s proprietary methods, has been shown through research to display the following characteristics. L. plantarum (probiotic) can be found in naturally fermented foods. In your body it is found in the large intestine where it helps to break down protein into usable nutrients, thus normalizing inflammation. L. casei (probiotic) is reported to be one of the most potent defenders from Listeria bacteria. It is also known for its ability to induce an immune response that is helpful in supporting a healthy urinary tract. B. longum (probiotic) aids in the cleansing and health of the colon and liver. It is also known for supporting normal breast health. Pre-biotics- Inulin IQ FOS (Fructooligosaccharides) - One of the best-known probiotics, FOS is a class of simple carbohydrates found naturally in certain plants, such as Jerusalem artichokes, onions and bananas. FOS is known to promote the growth of beneficial bacteria in the gastrointestinal tract. It has been shown to stimulate growth of Bifidobacterium in the colon facilitating good colonization. IP-6(Inositol Hexaphosphate) - a complex carbohydrate found in virtually all mammals, most cereals, nuts and legumes and that is composed of the sugar inositol with six phosphate groups, is a natural plant antioxidant. IP6 is one of the components of fiber that has been said to support good gastrointestinal health. Increased cellular levels of IP-6 have been linked to increased immune system activity. Additionally, IP6 has been shown to have potent antioxidant properties and to support normal kidney function as well as normalize cholesterol and lipid levels. Beta Glucans 1, 3-1, 6 have potent immune stimulating properties that help with the production of macrophages, the large white immune cells that attack aberrant cells in the body and remove toxic debris. Beta Glucans have also been shown to increase protection of the immune cells from the damage of radiation. Many in the medical community concede that the increase of the microbial killing activity of leukocytes and immune function, as a result of supplementing with Beta Glucans, suggests a clear effect on supporting a strong immune defense. Zinc - serves many functions, including acting as a constituent to at least 25 enzymes involved in digestion and metabolism. Research indicates that the health of the body’s natural killer cells may be dependent on zinc intake for normal growth and development. Zinc is very important for proper function of the thymus gland and thymus hormones, as well as cellular immunity. Copper - is necessary for the growth, development and maintenance of the bone, connective tissue, brain, heart and many other body organs. Colostrum- for human use is harvested from dairy cattle, as the components are identical to that of human colostrum, except that bovine colostrum is more concentrated. Colostrum from the first lactation is highest in immune proteins and transfer factors; NWC uses whole bovine colostrum from the first lactation of New Zealand disease-free cows that have not been fed chemicals, antibiotics, pesticides or steroids. That is where we get our Colostrum. It supports a strong immune system also in the GI tract. It also helps maintain the intestinal lining and promote healthy intestinal flora. One capsule three times a day preferably with a meal. For general good health, most experts recommend between 6 to 17 billion CFU's each day. Take the dose suggested on the bottle or used in successful medical trials for that health problem. For a major health problem you need to be guided by your personal health professional. 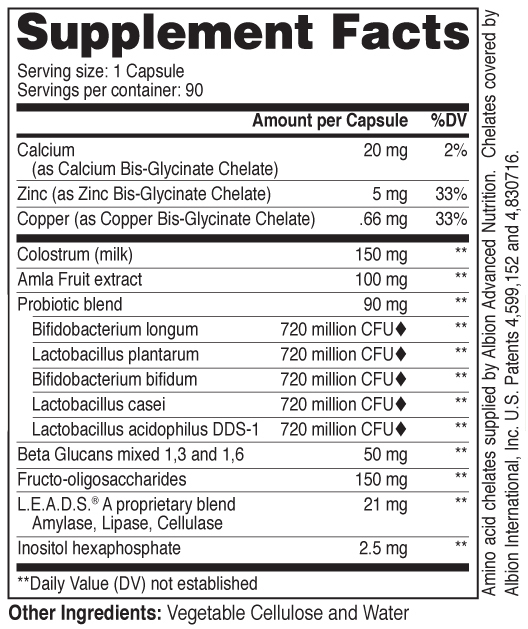 Our capsules have 3.60 billion live pro-biotics per capsule of the top five immune support strains per capsules. Our chewables have 5.5 Billion CFUs per Tablet.